Game of Thrones season 6, episode 5, "The Door", was a (pardon the phrasing) game-changer in more ways than one; not only because Hodor's (Kristian Nairn) backstory was revealed through Bran Stark's (Isaac Hempstead Wright) visions even as Hodor's fate was sealed in the present, but also because it confirmed what had been suggested by an earlier season 6 episode: that Bran can, in fact, affect the past with his visions. Or, to be more exact, that select events either happening in the show's present or set to occur in the future may have been set in motion (or will be on a future Game of Thrones episode) by one or more of Bran's trips through time. "The Door" also illustrated the dark side of this revelation; at the same time, subtly implying that Hodor's sudden brain damage as a young man may not be the only previously-inexplicable event in the past that Bran (or, if you will, the new Three-Eyed Raven) was responsible for causing. Game of Thrones didn't explore that implication any further with the followup episode, "Blood of My Blood", since it picked mere moments after the dramatic conclusion to "The Door" - as Bran was still in the midst of processing all of the knowledge of history that the former Three-Eyed Raven (Max von Sydow) has rapidly uploaded into his consciousness during the Night King and White Walkers' attack, as Meera Reed (Ellie Kendrick) desperately dragged his comatose body to safety. However, "Blood of My Blood" did show viewers flashes of what Bran was seeing, including many an event that had transpired in Game of Thrones seasons past; the death of Ned Stark (Sean Bean), the birth of Daenerys Targaryen's (Emilia Clarke) dragons, and the Red Wedding among them. Bran's vision was all the more intriguing because it also showed certain events that had only ever been described on the TV show, even as it featured glimpses of events from the past and possibly the future that viewers at home do not fully understand just yet. Let's break down some of the bigger aspects of this sequence, shall we? Back in Game of Thrones season 3, episode 5, "Kiss by Fire", Jaime Lannister (Nikolaj Coster-Waldau) told Brienne of Tarth (Gwendoline Christie) what he claimed was the true story behind his decision to kill King Aerys II Targaryen a.k.a. The Mad King; namely, that Jaime killed Aerys after the king ordered him to execute his own father and then set King's Landing aflame via Wildfire. Bran's vision of The Mad King in "Blood of My Blood" verified key parts of Jaime's story, as it showed Aerys yelling his infamous chant of "Burn them all!" before being stabbed in the back by the man who would become known as Kingslayer. However, by revisiting this pivotal event in Game of Thrones history, "Blood of My Blood" raised the question: just why, exactly, was The Mad King so, well, mad? 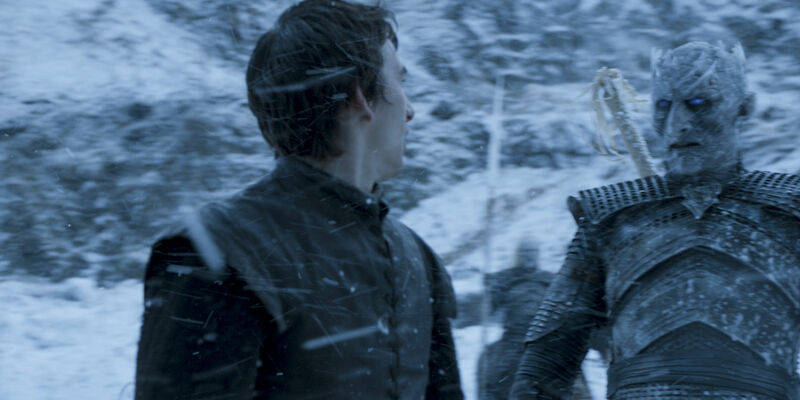 Bryan Cogman, who wrote "Blood of My Blood", told EW that the conclusion to "The Door" is a sequence that "moves the story and mythology into such a new and mind-bending direction" and Game of Thrones fans have been more than happy to speculate away about just what this development means for the larger storyline at hand. One popular theory at the moment is that Bran may have been the one responsible for Aerys' madness and that the king's "Burn them all" chant was, in reality, the result of Bran attempting to warn the king about the White Walkers, thus leading the king to be driven insane by the "voices" that only he could hear. There are far more far-fetched theories about Bran being tossed about by Thrones fans at the moment (Forbes has a nice round-up of them), but The Mad King's appearance in "Blood of My Blood" could be taken as proof that this particular Bran theory might well be on the right track. Bran, over the course of watching history literally flash before his eyes, unfortunately winds up having to revisit horrible events from the Stark family's past - namely, the deaths of Bran's parents and brother. Game of Thrones viewers no doubt felt pangs of sorrow at having to revisit the footage of Ned being beheaded, Robb (Richard Madden) being gutted, and Catelyn (Michelle Fairley) having her throat cut... but they may have also felt curious, as Bran's vision included shots of young Ned (Robert Aramayo) at the Tower of Joy sequence depicted in the previous season 6 episode, "Oathbreaker". Ned was once again shown demanding to know the location of his sister, Lyanna, before we were shown the image of what appeared to be his hand, covered in blood, aside some unidentified (dead?) body. The immediate conclusion is no doubt the most obvious one to fans who are all too familiar with the "R + L = J" theory that was initially postulated by those who've read George R.R. Martin's A Song of Ice and Fire source novels, before Game of Thrones began its run on the small screen. That shot is presumably showing Ned aside Lyanna, who has just died giving birth to the son, Jon Snow (Kit Harington), that she had with Prince Rhaegar Targaryen. It fits with the idea that Bran is seeing various members of the Stark clan die here, as well as the not-so-subtle "R + L = J" hints that have been dropped on Game of Thrones in episodes past. At this point, it's becoming less a question of whether or not this Thrones theory is valid and more a question of when, exactly, the show will reveal the truth about Jon's heritage (perhaps in the aptly-titled penultimate season 6 episode, "Battle of the Bastards")? The 'Song of Ice and Fire' element of Bran's vision in "Blood of My Blood" is perhaps the most self-explanatory. Bran not only watches the Children of the Forest create the White Walkers (having only just watched this event during "The Door"), but also watches Dany's "children" being born and growing up, leading to Bran once again seeing the image of a dragon's massive shadow being cast over King's Landing's rooftops. Bran also sees flashes of the White Walkers marching towards The Wall and how the Night King's army has only continued to swell in size in recent times (see the Battle of Hardhome). As Davos Seaworth (Liam Cunningham) puts it in a scene that will take place during next week's episode ("The Broken Man"), "Make no mistake. The Dead are coming." More intriguingly, though, are the flashes that Bran has of pyromancers beneath the streets of King's Landing, lighting up the cache of Wildfire that was previously shown to have been accumulated - on Cersei Lannister's (Lena Heady) orders - in Game of Thrones season 2. Are these scenes of events that took place in the past or that will transpire in the foreseeable future? If the latter, why is King's Landing being set ablaze; have White Walkers descended upon the city, or has Dany and her army (which now includes the Unsullied and Dothraki warriors) attacked King's Landing at last - and the Wildfire is being unleashed as a last resort to drive them out? Suffice it to say, Game of Thrones still has more than a few riddles up its sleeves that remain to be resolved. Game of Thrones season 6 continues next Sunday with ‘The Broken Man’ @9pm on HBO.